Find how a load cell.works on this link. 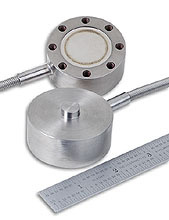 OMEGA’s LCM305 and LCM315 Series Load Cell is a heavy duty miniature (51mm dia.) compression load cell. Factory Mutual Intrinsically Safe rating is standard. Its small size and low profile make it ideal for test benches, prototype structures and industrial weighing applications. There are 8 x M5 mounting holes in the base of the load cell for locating it securely to the test fixture or structure. The LCM305 & LCM315 series are also available in imperial configurations, with ranges from 0-25 to 0-20,000 lb. Please see the LC305 for complete details, or contact our Sales department for more information. Dimensions: Press "Specs" button below picture. Panel Mountable 4 Digit Indicator for use with LCM305/315 series load cells, 230VAC powered. Note: All LCM305 and LCM315 series load cells include a 5-Point calibration certificate at 0%, 50%, 100%, 50%, 0% of full scale.